The UFC Adaelaide bonuses and attendance have been released. Last night (Dec. 1), UFC Adelaide took place inside the Adelaide Entertainment Center in Adelaide, Australia. Headlining the card was a heavyweight clash between Junior dos Santos and Tai Tuivasa. While Tuivasa had his moments, it was dos Santos who scored a second-round TKO victory. 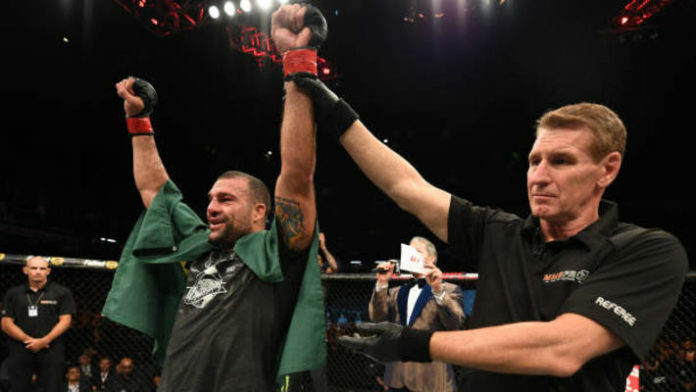 The co-main event saw a light heavyweight bout as Mauricio “Shogun” Rua went one-on-one with Tyson Pedro. Rua earned a third-round TKO victory. With the victory, “Shogun” has rebounded from a brutal knockout loss to Anthony Smith. He also nabbed $50,000 as a “Performance of the Night” bonus. The other man who took home a “Performance of the Night” bonus was Sodiq Yusuff. He stopped Suman Mokhtarian with a barrage of punches in the opening round. Mokhtarian protested the stoppage as he was covering up while standing, but it was an impressive display from Yusuff nonetheless. “Fight of the Night” honors went to Kai-Kara France and Elias Garcia for their bout on the preliminary portion of UFC Adelaide. The two fought hard for three rounds, but it was Kara France who picked up a unanimous decision win with a dominant performance. Some argue that bouts like this are why the flyweight division should continue in the UFC. As far as attendance is concerned, UFC officials announced that the event drew 8,652 fans. A live gate number came out to $1,026,937. MMA News has you covered with results, highlights, and post-fight tidbits from UFC Adelaide. Be sure to keep checking the homepage for the latest news.